1997 (MCMXCVII) was a common year starting on Wednesday of the Gregorian calendar. 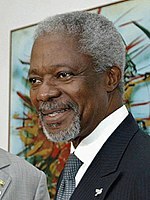 Kofi Annan becomes UN Secretary-General. January 1 – Kofi Annan becomes Secretary-General of the UN. January 8 – Mister Rogers receives a star on the Hollywood Walk of Fame. January 9 – Yachtsman Tony Bullimore is found alive five days after his boat capsized in the Southern Ocean. January 18 – In north west Rwanda, Hutu militia members kill 3 Spanish aid workers, 3 soldiers and seriously wound 1 other. January 19 – Yasser Arafat returns to Hebron after more than 30 years and joins celebrations over the handover of the last Israeli-controlled West Bank city. January 20 – Bill Clinton starts his second term as President of the United States. January 21 – Newt Gingrich becomes the first leader of the United States House of Representatives to be internally disciplined for ethical misconduct. January 22 – Madeleine Albright becomes the first female secretary of state after confirmation by the United States Senate. January 23 – Mir Aimal Kasi receives the death sentence for a 1993 assault rifle attack outside CIA headquarters that killed 2 and wounded 3 others. January 27 – It is revealed that French museums had nearly 2,000 pieces of art that were stolen by Nazis. January 28 – Clive Davis receives a star on the Hollywood Walk of Fame. February 22 – Scientists in Scotland announce the cloning of Dolly, born on July 5, 1996. February 23 – A small fire occurs on the Mir space station. February 27 – Divorce becomes legal in the Republic of Ireland. Tony Blair becomes Prime Minister of the United Kingdom. Korean Airlines Flight 801 crashes on Guam. March 6 – Guyana's President Cheddi Jagan dies in office. March 22 – At age 14, Tara Lipinski becomes the youngest figure skating world champion. March 24 – The movie The English Patient wins an Academy Award for best picture. April 29 – 126 people are killed in a train crash in Hunan, China. May 1 – Tony Blair of the Labour Party is elected Prime Minister of the United Kingdom in a landslide victory over the Conservatives, who lose all of their seats in Scotland and Wales, and lose power after 18 years in Government. May 3 – Katrina and the Waves win the Eurovision Song Contest for the United Kingdom. May 10 – An earthquake in northeastern Iran kills 2400 people. May 16 – Mobutu Sese Seko leaves Zaire. May 17 – Laurent Kabila's troops enter Kinshasa, as Zaire changes its name to Democratic Republic of the Congo. May 23 – Mohammad Khatami is elected President of Iran. June 13 – Timothy McVeigh is sentenced to death for the Oklahoma City bombing. June 25 – The town of Plymouth on the Caribbean island of Montserrat is evacuated as the Soufriere Hills volcano erupts. June 26 – Bertie Ahern becomes Taoiseach of the Republic of Ireland. 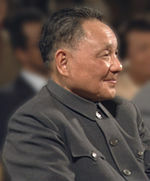 July 1 – The United Kingdom hands control of Hong Kong back to the People's Republic of China. July 15 – Fashion designer Gianni Versace is shot dead in Florida by spree killer Andrew Cunanan. July 25 – K. R. Narayanan becomes President of India. August 4 – Jeanne Calment dies after a record human lifespan of 122 years and 164 days. August 6 – Korean Air Flight 801 crash lands on the island of Guam, killing 228 people. August 31 – Diana, Princess of Wales, Dodi al-Fayed and their driver Henri Paul are killed in a car crash in Paris. September 5 – The 2004 Summer Olympics are awarded to Athens, Greece. September 6 – The funeral of Diana, Princess of Wales takes place at Westminster Abbey in London. It is watched by over 2 billion people worldwide. September 11 – Voters in Scotland approve the creation of their own regional parliament in a referendum. September 18 – Voters in Wales approve the creation of their own Assembly in a referendum. September 26 – The regions of Umbria and Marche in Italy are hit by a strong earthquake. September 26 - An Airbus A300 of Garuda Indonesia Airlines crashes in Medan, Sumatra, killing all 234 people on board. October 15 – NASA launches the Cassini-Huygens probe to Saturn. October 16 – The New York Times' first colour photographs appear. Mary McAleese is chosen as President of Ireland on November 11, 1997. November 11 – Mary McAleese is chosen to succeed Mary Robinson as President of the Republic of Ireland, marking the first-ever woman to woman Presidential transfer. November 17 – 62 people are killed by Islamist terrorists in Luxor, Egypt. December 11 – The Kyoto protocol is approved by a UN committee. December 19 – Janet Jagan becomes President of Guyana, succeeding her deceased husband, Cheddi Jagan. December 19 – James Cameron's movie Titanic is released in the US. Algerian Civil War: Hundreds of people are killed in massacres throughout the year. Wikimedia Commons has media related to 1997. This page was last changed on 25 March 2019, at 17:02.